Autodesk has unveiled the latest version of its professional video editing software Autodesk Smoke 2015 as well as debuting Flame 2015. Autodesk has unveiled the latest version of its professional video editing software Autodesk Smoke 2015. In addition to significant new creative tools and performance enhancements, Smoke 2015 will soon be available as a Desktop Subscription, so customers can access the software on a pay-as-you-go basis for the first time. Smoke 2015, a professional video effects and editing tool for Mac-based studios, now features 3D Tracker, a new Timeline FX workflow, added hardware support and optimisation for the new Mac Pro running OS X Mavericks and better interoperability with Final Cut Pro X. “For us, Smoke is a fantastic tool. I love the one place solution that Smoke offers; it saves hours of production time. We use Smoke as our main tool on music videos, tour visuals and motion graphics – from Madonna to The Prodigy to MTV. I want Smoke on every desk in my studio,” said Eugene Riecansky, creative director, Rockstar (UK). · Improved integration with Final Cut Pro X that supports more timeline and effects metadata for a fast, high fidelity project transfer between the apps. In addition, Smoke sequences can be exported as XML with accompanying QuickTime media files. At NAB, the company is also debuting Flame 2015 – the latest iteration of its comprehensive toolset for high-end visual effects and creative finishing – with new creative tools, faster performance, and an end-to-end 4K workflow to meet the needs of today’s high-end post production facilities. Flame 2015 allows artists to work creatively and interactively to deliver high quality final results at 4K resolution. 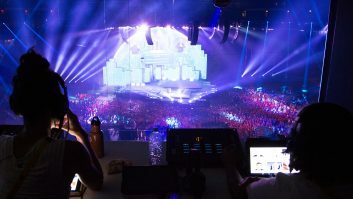 The new workflow helps deliver on the needs of today’s Flame artists with: industry standard 4K formats; 4K/UHD color management supporting ACES and REC-2020 colour spaces; realtime monitoring and playback via SDI of 4K/UHD material at 50P and 60P; timeline effects and batch nodes performance optimization & 4K capable substance textures; and 16 Gb fibre channel controllers in high-performance storage for realtime throughput of high resolution images.